Tesla stock price has been trading within a consolidation zone over the last 18 months with upper boundary the 387 resistance level and lower boundary the 245 support barrier. Looking at the short-term timeframe, the price rebounded on the 280 level, while the technical structure confirms the positive bias. The stochastic oscillator continues to move higher towards the overbought level. 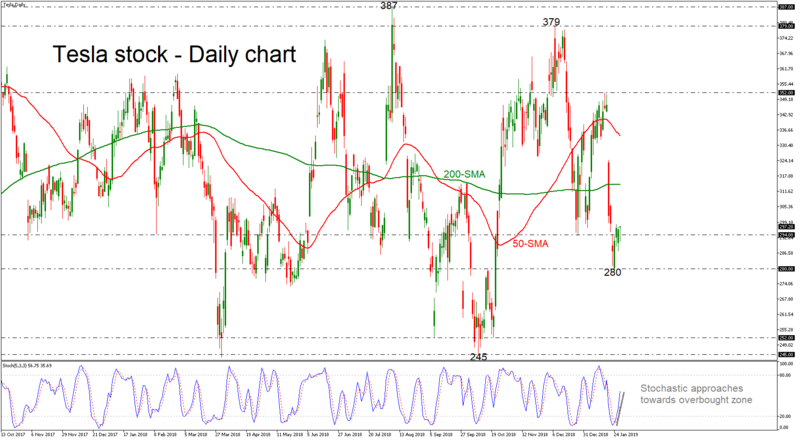 Another wave of advances in the stock could stall initially near the 200-day simple moving average (SMA), which stands near 314. An upside break would open the way for the 50-day SMA around 334, a level that if breached as well, would drive the market towards the 352 resistance. On the downside, declines may encounter preliminary support around the 280 region. A bearish violation would increase chances for more downside pressure until the 252 support. Another break below that barrier could open the way for the lower band of the range of 245. Summing up, in the long term the picture seems cautiously neutral still. A break above 379 would turn it firmly positive, while a move back below 245 would shift it to bearish.